After back to back games of Blades in the Dark I was exhausted. I went to find Karen, who had just finished up her larp and I saw that see seemed positively giddy about playing another game with Jon and Brodie. I was super dubious because I was so tired, but they promised it was a short game, so hey, let’s give it a shot. A Crow Funeral is a game for 2+ players which can play in 10-30 minutes. The game is intended for a busy space, like a convention or mall or the outdoors. Players should know that the game involves touching hands and people being shouted down for speaking out of turn. 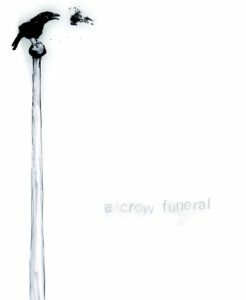 In A Crow Funeral the players will take the roles of opinionated crows arguing the cause of death of a member of their murder. At the beginning of play players will split apart for a short while, then come together and join as a group. The game uses a simple hand stacking mechanic guiding who can speak at any given moment. There is no conflict resolution mechanic. A game about yelling “hey, hey, hey” at each other and flying around like crows. Okay, I’m sold. After acquainting ourselves with the rules we will begin the game by spreading out, traveling in different directions for one minute. At the end of that one minute of travel we will stop in a safe place; this is our home. Around us is the environment we have spent our crow lives, these are the things to which we are acclimated and do not fear. Players will spend two minutes standing still and observing this environment while thinking peaceful, safe thoughts. Ask yourselves: What do I eat here? Where do I sleep? How do I spend my time? Study the objects, the motion, the people around you. Listen to the sounds, smell the air. Nothing here is a threat. While sitting in their home the crow should find a small object of some sort which can be used as a token: A pebble, a piece of paper, a stick, anything that conveniently fits into the palm of the hand. This object should be clean and safe to handle. If the player is uncomfortable taking something from the environment they may use something of their own, such as a coin or a die. After the two minutes have elapsed all the crows will return to the play area for the funeral. As crows arrive they should arrange themselves back into their circle. When most of the crows have arrived the funeral will begin. I ran into the bar itself, found a soy sauce packet that was left over on a table and then found a little place away from people and watched a boxing match that was projected on the all above me. I saw the people talking and was surprised to go largely unnoticed. One friend said hi, but otherwise I was able to think about my life as a crow there. When I returned we found the dead crow and argued about how it died. The argument only took a few minutes, but it did include me throwing a fit when my theory wasn’t accepted and leaving the murder. This made me an outsider and I spent the rest of the game harassing the crows in my former murder, but I would never be a part of them again. This game is very smart because it asks specific questions during the debrief. What informed the arguments of the crows? Will they actually be safer for what was learned at the funeral? If there was a split in the murder, how will those different beliefs affect crow society? Did anyone drop their token to remain with the murder? What did this represent? Whose hands were usually at the top of the stack? Whose were at the bottom? Did the people who were mostly at the bottom feel respected during the funeral? Who is speaking the most during the debrief? Is there a correlation between how people are speaking now and how they spoke during the game? Smart stuff here! You should check it out.